Gold declined modestly Wednesday after two straight days of 40-cent gains, but still marked a 5-3/4-year low. Silver closed at an 11-week low and extended its losing streak to eight sessions. Gold for December delivery dipped $3.60, or 0.3%, to settle at $1,084.90 an ounce on the Comex division of the New York Mercantile Exchange. The settlement was the weakest since Feb. 10, 2010 when prices ended at $1,076.30 an ounce. "Overall trading activity in the U.S. was quieter Wednesday as it was the Veterans Day holiday, when most of the U.S. government and most banks were closed," Jim Wyckoff, a senior analyst at Kitco Metals Inc., said in a report. "Lower Nymex crude oil prices that were poised to close at a 2.5-month low close Wednesday were also a bearish ‘outside market’ working against the precious metals bulls." 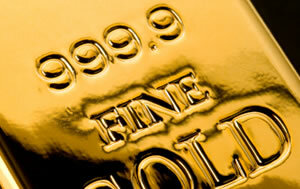 Gold prices ranged from a low of $1,083.20 to a high of $1,093.50. They are 0.3% lower on the week. Silver for December delivery dropped 9 cents, or 0.7%, to $14.26 an ounce, the lowest since Aug. 26 when the settlement was $14.04 an ounce. Silver prices ranged from $14.23 to $14.49. They are 2.9% lower than Friday. January platinum declined $16.40, or 1.8%, to $883.10 an ounce, trading between $880.80 and $907.90. Palladium for December delivery fell $20.80, or 3.5%, to settle at $577 an ounce, ranging from $574.70 to $603. Gold shed $1.20, or 0.1%, to $1,085.90 an ounce. Silver fell 11 cents, or 0.8%, to $14.44 an ounce. U.S. bullion sales were muted Wednesday as the United States Mint was closed in honor of Veterans Day.